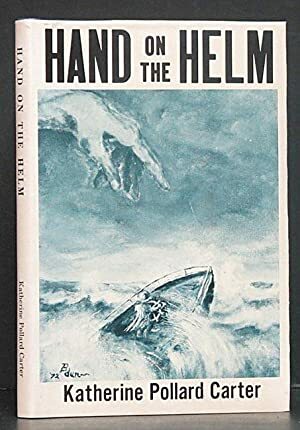 Hand on the Helm, written by Katherine Pollard Carter. Image available on the Internet and included in accordance with Title 17 U.S.C. Section 107. CARTER, KATHERINE POLLARD (1900–1989). Katherine Pollard Carter, religious writer, was born on January 20, 1900, in Wichita Falls, Texas, the eldest of William T. and Addie (Ford) Pollard's three living children. She grew up in various Texas communities where her father worked as a school administrator, including Wichita Falls, Alpine, Orange, Dallas, Austin, Cameron, Pearsall, Gonzales, and Houston. She completed high school in Del Rio. She studied journalism at the University of Texas, where she graduated in 1922. She then took graduate journalism courses at Columbia University in New York before returning to Texas by 1924. She settled in Houston and began a career in public relations and advertising. In June 1938 Katherine Pollard married Kenneth I. Carter, a Bay City farmer. She taught school for several years, then worked in the curriculum department of the Houston Independent School District. In 1946 she wrote a set of graded books, the "Carter Sono-Speller Work Book and Spelling Tablets," distributed mostly in Texas. In 1951 she received a master's degree from the University of Houston. She subsequently returned to writing, primarily radio copy and newspaper articles. She took assignments at the Daily Tribune and the weekly Matagorda County Tribune, both published in Bay City. For a few years she was editor of another local weekly. During the 1960s Mrs. Carter's spiritual interests prompted her to resign the editorial post to write inspirational books. In 1972 she produced Hand on the Helm: Phantoms, Visions, Voices and Dreams That Have Changed the Course of History. Three years later she followed with Heard in Heaven: Miraculous Answers to Prayer That Have Affected the Fate of Nations. Portions of these home-published books were combined with another of her manuscripts in a paperback edition titled Hand on the Helm, which Whitaker House published in 1977. That year Carter died, and Katherine Carter moved to Weslaco in 1978. She devoted most of her last years to writing scripts based on her books. Her hope was to interest producers in adapting them for a television series, but she was unsuccessful in this. She died on September 8, 1989, in Weslaco and was buried in Bay City. Alcalde (magazine of the Ex-Students' Association of the University of Texas), January 1947. Vertical Files, Dolph Briscoe Center for American History, University of Texas at Austin. Handbook of Texas Online, Sherilyn Brandenstein, "CARTER, KATHERINE POLLARD," accessed April 23, 2019, http://www.tshaonline.org/handbook/online/articles/fcabv.